GG plus/VGC plus.Bloomsbury,1997-2017. 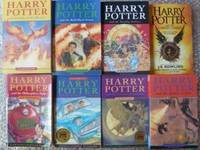 Harry potter set with all 7 children's paperback editions. All seven books are First UK Bloomsbury Paperback editions-first printings with full run number or it states "First Edition" on the copyright pages. Harry Potter and the Philosopher's Stone has all four important issue points. 1) The publisher is listed as Bloomsbury at the bottom of the title page, 2) The date listed in the copyright information is 1997, 3) The copyright page have the full print line (10 9 8 7 6 5 4 3 2 1), 4) On page 53, in the list of school supplies that Harry receives from Hogwarts, the item "1 wand" appears twice. Also, Joanne Rowling is displayed on copyright page , picture of young Dumbledore at the back of the cover, on copyright page contains no space between "r" and "1" on Thomas Taylor 1997, philos(o)pher's misspelled at the back cover. With the set included book 8: Harry Potter and the Cursed Child - Parts One and Two: The Official Playscript of the Original West End Production, First UK Sphere paperback edition-first printing. Book 1 is in GC plus with small creases and nicks on the cover and spine, small ink marks and slightly tainted on the outer edges, a couple of small creases and slightly yellow on the edges of the pages, small mark on the edges of some of the pages, previous owner's name written on the edges of the half-title page of the book. The book is in GC plus for its age but with some shelf wear. Wendy Cooling review is present to the base of the front board. Book 2 to 7 are in VGC plus with a couple of small nicks and creases on the edges of the cover and spines, nice and clean pages with small nicks and light shelf wear on the outer edges, small creases on the edges of the pages. a couple of small marks on the outer edges for books 6 and 7.Book 8 is new. Printed by Clays. A collectable set of first paperback edition-first printing. Please note: Harry Potter and the Philosopher's Stone is scarce true First UK paperback edition-first printing with all important issue points, its not the Canadian edition, Australian edition or Ted Smart edition! One of 5,150 copies, many lost into libraries and it's thought not many of these books still remain in circulation. With the set we will include the following books: The Tales of Beedle the Bard, Collector's Edition (First UK edition-first printing of this Special Collector's Edition) the book is new, plus Comic Relief: Fantastic Beasts and Where to Find Them and Quidditch Through the Ages , both are First UK paperback edition-first printing with full run number (10 9 8 7 6 5 4 3 2 1) published by Bloomsbury in 2001- the book are in VGC with light shelf wear on the outer edges of the pages. More photos available on request. This is another paragraph Book Description: Harry Potter is an ordinary boy who lives in a cupboard under the stairs at his Aunt Petunia and Uncle Vernon's house, which he thinks is normal for someone like him who's parents have been killed in a 'car crash'. He is bullied by them and his fat, spoilt cousin Dudley, and lives a very unremarkable life with only the odd hiccup (like his hair growing back overnight!) to cause him much to think about. That is until an owl turns up with a letter addressed to Harry and all hell breaks loose! He is literally rescued by a world where nothing is as it seems and magic lessons are the order of the day. Read and find out how Harry discovers his true heritage at Hogwarts School of Wizardry and Witchcraft, the reason behind his parents mysterious death, who is out to kill him, and how he uncovers the most amazing secret of all time, the fabled Philosopher's Stone! All this and muggles too. Now, what are they? This is Jo's first book and she has already written seven outlines for Harry's further adventures at Hogwarts.